Striped bass is well known for sports fishing, especially on the east coast of North America. Striped bass can range in size, but generally speaking, they are a very large fish that can reach up to 80lbs, maybe even more. On record, the largest striped bass caught by an angler was in 2011 in Westbrook, Connecticut, and this beast weighed in at a whopping 81.8 lbs! While not all striped bass that is reeled in will weigh even close to that much, 30-50 lbs certainly aren’t uncommon. Even as far North as Nova Scotia, you can find striped bass in the local waters that exceed 40 lbs. Just recently, a local angler reeled in a 41 lb striped bass from Grand Lake, and even with that being a really impressive feat in itself, the local angler admitted that he has seen bigger ones caught there before. It’s not just the size of striped bass that makes them a fun target in sports fishing. They also provide an incredible challenge to catch, as they are quite elusive. Like any other fish, the species has some habits that are well understood, but overall, they are more unpredictable than lots of other fish, which takes skill and luck extra important factors. Furthermore, striped bass can be found all along the east coast of North America, with most residing between Florida and Nova Scotia. Stripers can also be found on the West Coast, but their range and numbers are much smaller, making them more difficult to catch. In this article, we will provide some tips on where to fish for striped bass, how to fish for striped bass, and some additional information to help get you on your way. Striped bass is most commonly found on the East coast of North America, from Florida all the way up to Nova Scotia. The Chesapeake Bay, which extends into both Maryland and Virginia, is the primary producer of striped bass, with the Hudson River in New York being the second-most substantial producer. The Chesapeake Bay has hundreds of rivers and streams flowing into the drainage basin from many different locations, making it an incredibly unique and diverse ecosystem. After spawning in locations such as the Chesapeake Bay and Hudson River, the striped bass migrates out into the ocean and usually head north along the coast. While they are usually deep water fish, they still stick close to the coast, so they definitely present a good opportunity for recreational anglers looking to catch a trophy fish. Given the information we presented above, you likely won’t be surprised to hear that most anglers fish for striped bass in saltwater environments. However, not all adult striped bass migrate out of the freshwater river systems into the ocean. Some remain in areas relatively local to where they spawned, and can sometimes live out their entire lives in freshwater. However, fishing for striped bass in freshwater is still rather limited, as many of the spawning locations are protected habitats in order to prevent further declines in striped bass populations. For example, in Nova Scotia, fishing for striped bass in tidal waters is open year-round, but on inland waters, the season corresponds with that of other sports fish (e.g. salmon, trout, smallmouth bass). Even further, an exception applies to some of these bodies of water, whereby some of them are closed off to striped bass fishing during spawning season (April 1 to June 30). Just make sure to double-check the rules and regulations of your local striped bass fishing waters before you head out. You will often hear striped bass referred to as opportunistic feeders, which can sometimes be synonymous with lazy feeders. There are advantages and disadvantages to this, but overall it makes it a little more difficult to select your tackle in advance. As we mentioned previously, striped bass like to stay in water temperatures of 55-68 degrees, but can definitely survive slightly outside that range as well. Regardless, when water temperatures drop to the lower end of their ideal range, they will move closer to the surface where the water is a little warmer. Conversely, if the temperature approaches their maximum limit, they will dive deeper to reach the cooler water. Therefore, knowing the water temperature is one of the first steps to your bait/lure selection. Striped bass mainly eats other fish, but they don’t always just go after any fish. With striped bass, you’ll want to be a little more aware of the prey fish in the area in order to replicate that prey as closely as possible. Popular live bait choices include eels, clams, bloodworms, nightcrawlers, shad, herring, and more. For artificial lures, spoons and large plugs are usually a good starting point. All this being said, there’s a good enough chance that your initial bait setup won’t be the most suitable, so it’s always a good idea to have lots of different bait and lures to choose from when trying to hook a striped bass. If you know the stripers are in the vicinity but aren’t taking the bait, try speeding up your retrieval. Stripers are odd in that they will pass up on potential grub more than lots of other species of fish. 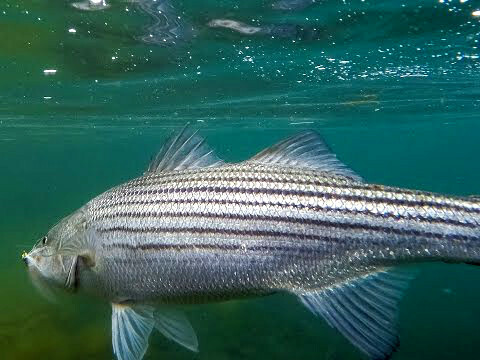 By employing a fast retrieval, you’re not allowing the stripers to have a chance at examining the bait, so they may opt to bite rather than pass up a potentially perfect food item. Try using realistic color schemes when there is ample light and the water is clear. On a cloudy day in the murkier water, brighter colors, or those that provide the stark contrast, may be a better choice. A lot of anglers have used a teaser rig when things aren’t going well for them. This involves rigging a smaller lure ahead of the larger main one. This will provide the illusion of a fish chasing a smaller fish for feeding, which makes it ultra realistic. See the video below for tips on how to set up a proper teaser rig, courtesy of Maybe Tonight Fishing Charters. 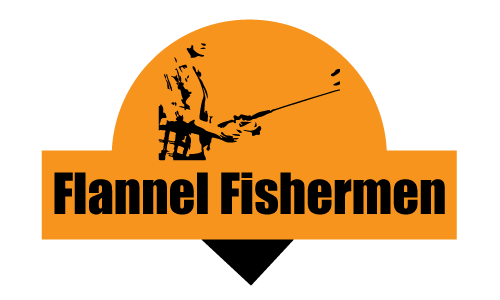 If possible, always use a fish finder! Striped bass is often found in deep waters, especially when the water temperature is warmer. You will be able to save lots of time by employing a fish finder to help you track down the stripers. If possible, a fish finder with a low-frequency transducer, or one with the newer CHIRP setting, would be ideal. Lower frequencies allow you to see down into greater depths, and although it may not provide as much detail as a high-frequency transducer, the stripers are big enough that you will be able to distinguish them from the surrounding terrain. The fishing gear that works best for you may be different from another angler fishing for stripers, but there are some key points to keep in mind when getting some gear together for stripers. We will highlight some of these considerations below. Generally speaking, you will likely want to use a longer rod if you’re fishing for striped bass. A few things to think about are bait selection, casting distance, and expected the size of fish. Usually, you can get away with using a 7′ rod with medium action for most situations. If you’re trolling, you might want slightly heavier action, especially if you’re trolling heavier lures. When surf casting, many anglers prefer a longer rod if possible, as this will help cast heavy bait further. Again, a medium-heavy action rod is ideal. For jigging, some prefer a fast action rod tip, but this depends on the line and your personal preferences, so there’s no right or wrong for this aspect of the rod. There isn’t too much to worry about when selecting a proper reel for fishing stripers. There’s even a decent chance that you already own a reel good enough for this setting. We usually prefer spinning reels, mainly because they’re common, versatile, easy to use, and most importantly, they can handle the job. One thing to keep in mind is that you will need the reel to be capable of holding lots of lines, somewhere between 200-300 feet. This may seem like a lot, but striped bass can be huge. So not only will you potentially have to cast far and sink the line to great depths, but if you hook a beast of a striper, it can take your bait for a ride, in which case you will want that extra line to play with. On that note, drag is important as well. Choose a reel that has easily adjustable drag. Ideally, star drags are preferred, but not necessary. Also, there’s a decent chance you might be using some braid, so just double check the reel can handle that, as well as enough of it. The fishing line that you choose for stripers is completely up to you and will depend on your own personal preferences. Some anglers prefer using mono because when the fish strikes, it gives them a bit more time to adjust the reel to allow line out before the fish feels the tug. Others prefer braided line for the strength and faster sinking capability, especially for jigging. Of course, incorporating a fluoro leader, and even a mono leader, is a common sight as well. In terms of strength, usually 20-40 lb test line will do the trick, depending on where you’re fishing.